call roll based on the registrar's current class list and people previously signed up on a waiting list, to get a handle on what course enrollment will be like. At the end of the session students can add their names to the waiting list. However, unless lots of spaces are available, I don't give out enrollment codes until the second week of classes. go through the syllabus, discussing course content and my teaching goals, requirements (especially my "midterm questions" and the writing assignments), present the course books, and say a little about my policies (such as absence & lateness, make-up work, cell-phones and plagiarism). Born in 1957, I grew up in Connecticut and went to college at Wesleyan University, a small liberal arts school in Middletown, not far from my home town. I majored in Physics, and did a lot of work in what would now be called computer science. I took courses in almost all subjects except history (I dropped the one I tried because I just couldn't get into it.) I learned a little German language in high school, then took a summer course and an accellerated one-year course in college. At the end of my junior year in 1977, I participated in the sit-in at the Seabrook, New Hampshire nuclear power plant construction site, which ultimately delayed my graduation from 1978 to 1979. I spent the 1977-78 academic year studying abroad at the University of Freiburg, which I enjoyed tremendously, especially art history courses. In 1979 I decided to break off my study towards an MS in Engineering at Columbia and return to Germany to study. I completed my BA-level exams (Zwischenprüfungen) in art history and history at Freiburg University in 1982, then transferred to the University of Munich, where I planned to get my MA. At that point I decided that I wanted to do my M.A. thesis on a more contemporary topic (post-World War II monuments and memorials), which was frowned upon in the rather conservative Munich art history department. After having received a warm welcome at the University of Hamburg during a student conference, I transferred there after only a year in Munich. In 1985 I co-authored a traveling photographic exhibition about World-War-II-era memorials (Stones of Contention, available on-line), then completed my MA in 1986 about a 1949 memorial in Hamburg (MA thesis contents and images). One of my research interests is what, how and why people learn about history (goes back to my own background as an avowed non-historian, as well as to my work on monuments and memorials). For many years I have been working with student groups to study how a Holocaust survivor's story affects students. The results are (somewhat haphazardly) published on my Holocaust Oral History Project website. Just for fun, try this BBC on-line quiz: What do you know about present-day Germany? (Dec. 2002). In German: siehe auch the Dec. 2005 Der Spiegel article "Die Hitler-Obsession," with a link to a German version of the quiz. What books and films about Germany have you read or seen? Have you ever traveled to Germany (when, what places did you visit, for how long)? What courses have you taken that have included material on Germany or German history? What recent news events concerning Germany can you think of? Name some famous Germans in the order that they occur to you. no one had seen Downfall, or Nasty Girl. Travel: A record (in my experience) 8 of 21 people who turned in their surveys had been to Germany: most to Berlin, then Munich, Frankfurt, Cologne/Dusseldorf, Hamburg, Vienna (Austria) and Dresden. Also to Mauthausen former concentration camp and Hitler's "Eagle's Nest." Courses: Seven students had taken Hist 4c (Western Civ. ), also lower and upper division Europe surveys, prof. Derwin's Holocaust Lit. course, and 3 quarters of German language. News events: election of first female chancellor Angela Merkel, new Berlin Holocaust memorial, natural gas supply problems because of Ukrainian boycott, collapse of ice rink roof on weekend. Famous Germans (this was very quick at the end): Hitler (10); Wagner (4); Kant, Bismarck, Einstein (3); Luther, Bach, Frederick the Great, Goethe, Grimm brothers, Beethoven, Marx, Nietzsche, Wilhelm, Durkheim, Hindenburg, Himmler, Rommel, Anne Frank, Schindler, Bonhoeffer, Kohl, Schroeder, and a basketball player (Dirk Nowitzki?). I was surprised at the high number of cultural figures--that has not been the case in the previous times I've asked this question. 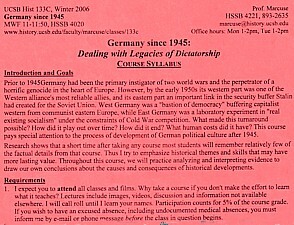 2006 syllabus; lecture 2: What is Germany?